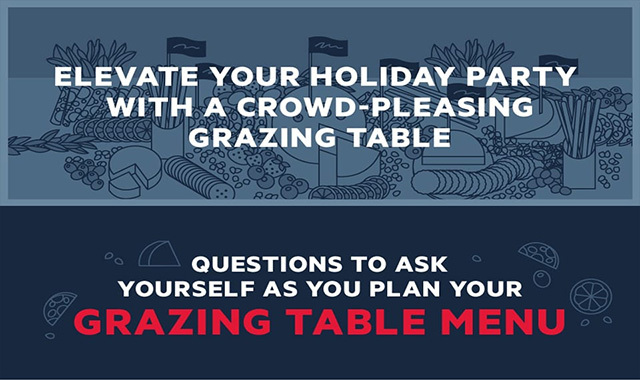 Elevate Your Holiday Party with a Crowd-Pleasing Grazing Table #infographic ~ Visualistan '+g+"
If you want the food at your holiday party or corporate event to be opulent and impressive—but still inviting—a grazing table just might be the answer to your culinary conundrum.This hot trend in entertaining isn’t exactly new. In medieval times, palace feasts often featured tables piled high with layers of food for guests to sample at their leisure. These days, grazing tables are more likely to feature local cheeses than, say, roasted peacock. But a year or two ago, a modern take on the grazing table began to take hold in Australia and New Zealand. Now it’s taking the U.S. by storm.